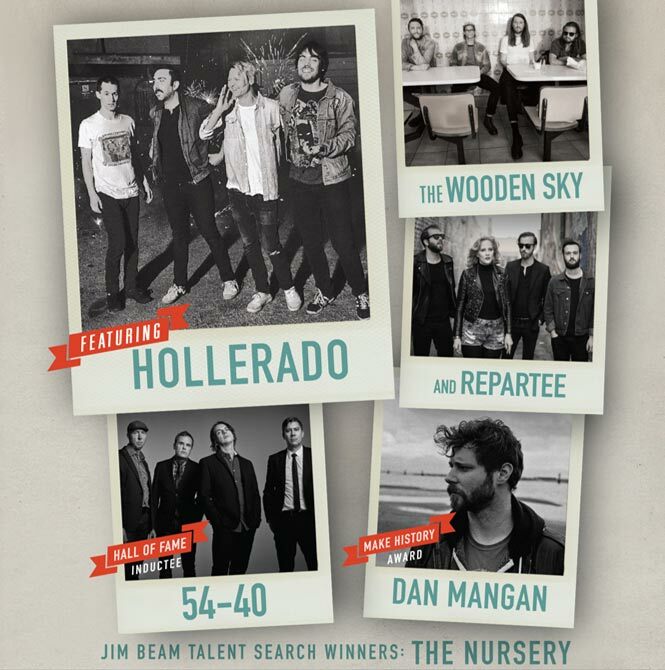 Celebrating the best of independent music – both Canadian and international – the Jim Beam INDIES with Indie88, is supported by The Ontario Media Development Corporation through the Ontario Music Fund, and promises an unforgettable night out. This year’s awards will be hosted by Indie88’s Matt Hart and Josie Dye, and will feature performances by Hollerado, The Wooden Sky, Repartee (nominated for Pop Artist/Group Of The Year), The Nursery (winners of the Jim Beam Make History Talent Search), Dan Mangan (recipient of the Make History Award), and a special set from 54-40 (Hall Of Fame Inductees). Fans can vote online as of today at http://www.indies.ca. NOW IN IT’S 35TH YEAR, CANADIAN MUSIC WEEK IS RECOGNIZED AS ONE OF THE PREMIERE ENTERTAINMENT EVENTS IN NORTH AMERICA FOCUSING ON THE BUSINESS OF MUSIC. THE CANADIAN MUSIC WEEK FESTIVAL SPANS 6 NIGHTS OF PERFORMANCES, WITH HUNDREDS OF SHOWCASING BANDS AT MORE THAN 30 LIVE MUSIC VENUES IN DOWNTOWN TORONTO. ALL CONVENTION FUNCTIONS TAKE PLACE AT THE SHERATON CENTRE TORONTO HOTEL, 123 QUEEN STREET WEST, TORONTO. BEAM SUNTORY INC. IS THE THIRD LARGEST SPIRITS PROVIDER IN THE WORLD, AND IT COMES AS NO SURPRISE THAT IT WOULD HAVE AT ITS HELM THE WORLD’S NO. 1 SELLING BOURBON: JIM BEAM®. SINCE 1795, WE’VE REMAINED TRUE TO THE BEAM FAMILY RECIPE, PASSED ON FROM SEVEN GENERATIONS. TODAY WE CARRY ON THE LEGACY OF THE LEGENDARY BEAM MASTER DISTILLERS AND MAKE HISTORY® IN EVERY BOTTLE. WE’VE MADE OUR HISTORY, AND NOW MAKE YOURS. FOUNDED IN 1988, CENTRAL ONTARIO BROADCASTING IS AN INDEPENDENT BROADCASTING COMPANY THAT OWNS AND OPERATES THREE RADIO STATIONS: INDIE88 IN TORONTO, ROCK 95 AND 107.5 KOOL FM IN BARRIE. INDIE88 (CIND-FM) OFFICIALLY LAUNCHED ON AUGUST 3RD AS CANADA’S FIRST INDIE STATION – GIVING GREAT MUSIC A HOME. THE STATION SUPPORTS THE MUSICIAN BEHIND THE SONG AND PUTS THE AUDIENCE FIRST. INDIE88 IS COMMITTED TO PROVIDING A PLATFORM FOR EMERGING CANADIAN ARTISTS AND ALL THEIR FANS. TO EXPERIENCE INDIE88, TUNE IN TO 88.1 FM AND INDIE88.COM.